Hello everyone! Sorry for the delay in sharing the results of the giveaway. I have been sick for the last two days and then yesterday we got slammed here in CT with 22" of snow! Here's a short video of my pup in the snow- playing for just a second to appease me. And the winner of the Nolan Necklace is..... Steph! Steph's email is thelazybees@yahoo.com. 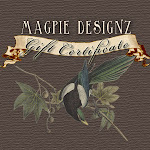 Steph, contact me at Emily@magpiedesignz.com to claim your prize! Thank you everyone for entering the giveaway and make sure to look out for more chances to win a Magpie Original again!